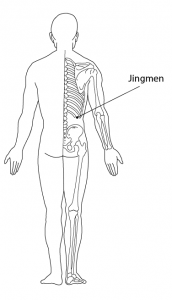 The other important acupuncture points that relate to the Middle Dantian中丹田 are the Jingmen 京門 Points.” Jing 京” means “Capital” and “Men 門” means “Gate”. It means “The Gate of the Capital”, so it must be important. The Jingmen points belong the Gall Bladder Channel of the Foot Shaoyin 足少陽膽經 and so they are also good for the Gall Bladder. They are also very sensitive areas. The Shanzhong 膻中 Point is at the centre of the chest and the Dabao大包 points are on the front-sides of the chest. 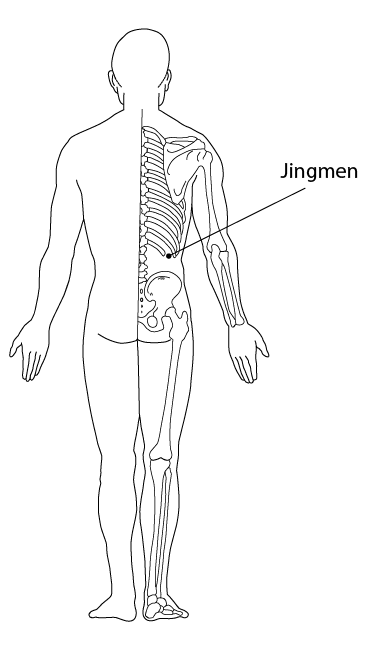 The Jingmen are on the lower side of the ribcage, on the last rib and so on the side of the body, but more to the back. They connect with the kidneys, intestine and stomach. When people have a swollen stomach or intestines, this can be because there is too much water. If we can open and stimulate the Jingmen points this can help to relieve this swelling. In Dayan Qigong 2nd 64大雁氣功後六十四, the 2nd movement “Draw Arms 收膀”We close five fingers to point on the Jing Men Point. That is important point for middle Dantian. The Middle Dantian needs the Shanzhong, Dabao and Jingmen points to be open as the all relate and create the Middle Dantian.